The Grange, officially referred to as The National Grange of the Order of Patrons of Husbandry, is a fraternal organization in the United States that encourages families to band together to promote the economic and political well-being of the community and agriculture. Founded after the Civil War in 1867, the Grange is the oldest American agricultural advocacy group with a national scope. The organization was unusual at that time because women and any teen old enough to draw a plow were encouraged to participate. The importance of women was reinforced by requiring that four of the elected positions could be held only by women. The Granger movement succeeded in regulating the railroads and grain warehouses. The births of the Cooperative Extension Service, Rural Free Delivery, and the Farm Credit System were due largely to Grange lobbying. Other significant Grange causes included Temperance, the direct election of Senators and Women's Suffrage. The Vernon Grange was organized in 1886 and moved into its own Grange Hall in Vernon Center in 1928. In 1996 GERALDINE STRONG wrote the following history of the Vernon Grange. It is printed here with her permission. A copy is on file at the Vernon Historical Society. The Patrons of Husbandry is a fraternal organization, commonly called 'The Grange.' The grange is actually the home or the center of the organization, thus the hall where the members meet is called the Grange Hall and the members are often called Grangers. The organization came into being shortly after the Civil War and was started to give farmers and their families a chance to get together socially and promote their common interests. Vernon Grange, No. 52, Patrons of Husbandry, was organized on November 29, 1886 in the house across the street from the present Grange Hall. For a while they met in members' homes, but soon became too large and rented the former 'Town Hall Room' in the basement of the First Congregational Church in Vernon Center. Membership continued to increase and many young adults and families welcomed a place to socialize. The church fathers put restrictions on activities held in the church building and, in particular, did not allow dancing. This prompted the Grangers to decide to build their own Grange Hall. Land was acquired in the Ogden's Corner section of Vernon and members were asked to make monetary pledges toward a building fund. In December of 1926 a ‘Board of Directors' was formed to be in charge of building a Grange Hall. A large agricultural fair was held the next year to raise money for the hall. The basic plans for the hall were acquired from the National Grange and the committee visited Echo Grange Hall in Mansfield, which had recently been constructed. This proved most helpful and the committee was able to get costs and more detailed plans from them. In November of 1927 the members voted to build a hall, but specified that it be built in Vernon Center. A lot was purchased from Edwin Baker for $600. Mr. E.T. Hallcher was contracted to build the hall for $6,036. This did not include digging the cellar, backfilling or painting which would be done by the members or contracted separately. A mortgage was obtained from Frederick W. Bradley for $4,000 at 6% interest payable semiannually. On June 6, 1928 Grange members assembled at the church and marched in a body to the site of the hall where a service was held and the cornerstone was laid by charter members of the Grange. The Vernon Grange Glee Club, a group of younger Grange members, had been busy earning money for the Grange Hall furnishings by staging minstrels and musical performances. Chairs and kitchen equipment were purchased by them for the new hall. The dedication of the hall was held in September of 1928 with a banquet and about 200 members and guests attending including State Master Minor Ives and National Grange's High Priest of Demeter, Charles Gardner. Chicken dinner back in the day. Although there was no running water in the Grange Hall and it was heated by a hot air wood burning furnace, it became a busy place. 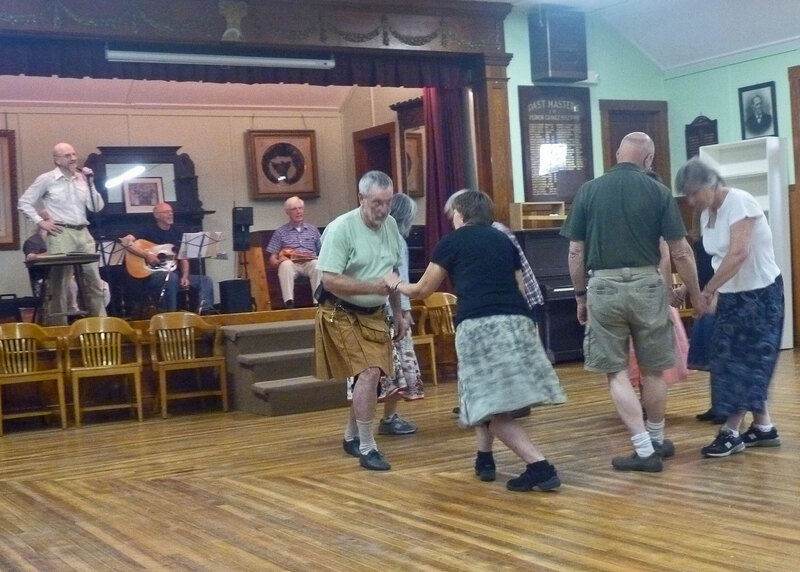 Square Dances were held every Saturday night and often there were more than 200 in attendance. The orchestra and prompter occupied the stage. There would be a single row of chairs against the wall around the room and as many as 24 sets of eight dancers would occupy the center of the hall, while one set of eight would dance in the hallway. People came from all the surrounding towns and although people of all ages attended many a young person of that era met their future mate at the Vernon Grange dances. The dances continued until the young men went into service in the 1940's during World War II. Another fundraiser for which Vernon Grange became famous was its Chicken Pie Suppers. Most of the farmers belonging to the Grange raised a few chickens and would donate an old hen. The men would dress the chickens and the women would cook them, take the meat off the bones and make gravy from the broth. On the day of the supper the pies would be assembled at the Grange Hall in 15 inch tins. There was plenty of chicken and gravy with a rich biscuit crust. The pies were then taken to Krause's Bakery in Rockville where they were baked and brought back hot in time to serve them. Mashed potatoes, vegetables and dessert were cooked at the Grange, mostly donated by members. They could feed 120 people in one serving and often there were two servings. People came from surrounding towns to partake of these delicious meals and the money earned was used to pay off the mortgage. In December of 1936 the final payment was made. In 1931 city gas was installed in the Grange Hall and a second hand commercial size gas stove was purchased for the kitchen. That same year an artesian well was dug, 155 feet deep. The cost of drilling was $442 and the pump and plumbing was $268. 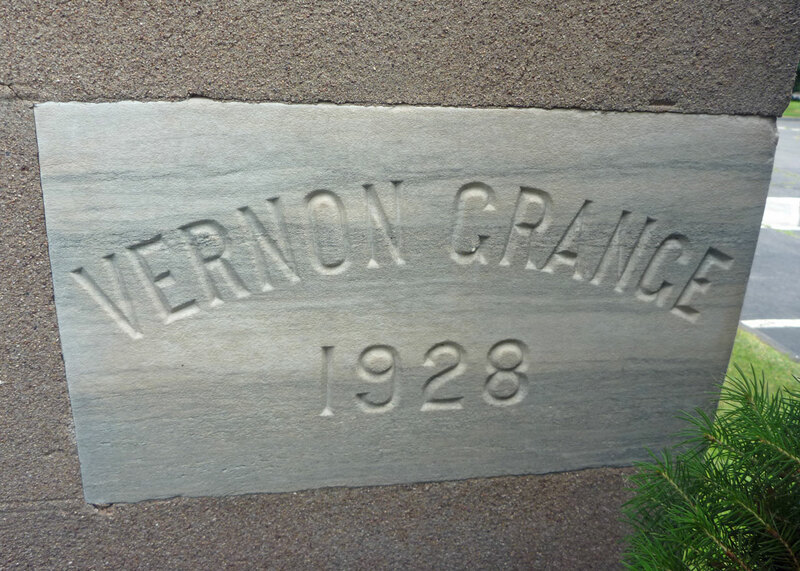 Vernon Grange was incorporated May 23, 1932 and all property of the organization was turned over to the corporation. 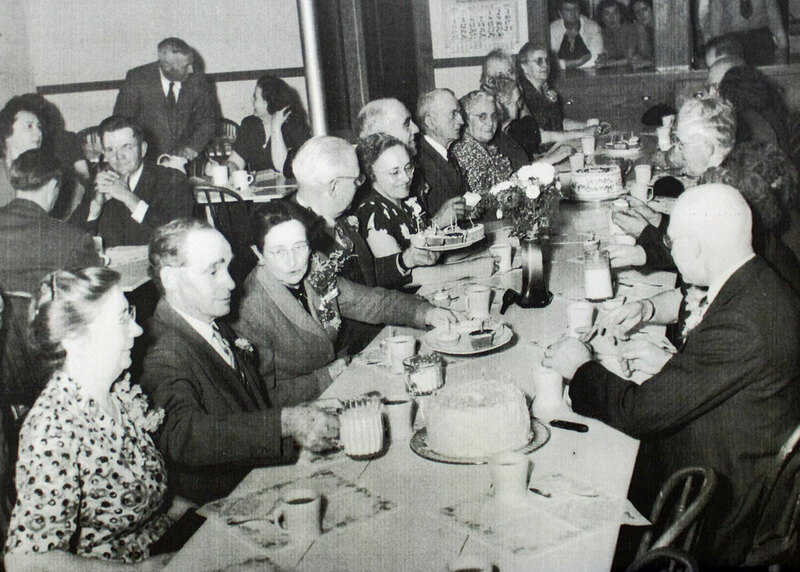 In 1936 a 50 year birthday party was held. About 150 members and guests attended the banquet and program. In the hurricane of 1938 the chimney was blown off and the roof damaged and had to be replaced. The driveway was also oiled that year. In 1940 the Board of Directors discussed enlarging the Hall because of the large membership and the crowds at the dances and suppers. No action was taken at this time, but they did vote to put an oil burner into the hot air furnace. The Grange continued to meet during World War II although their activities were very much restricted. With the young men in service and those at home working long hours in the defense industry and the farm, and with gas and food being rationed, they supported the war effort by encouraging ‘Victory Gardens,' purchasing war bonds and remembering their service men. 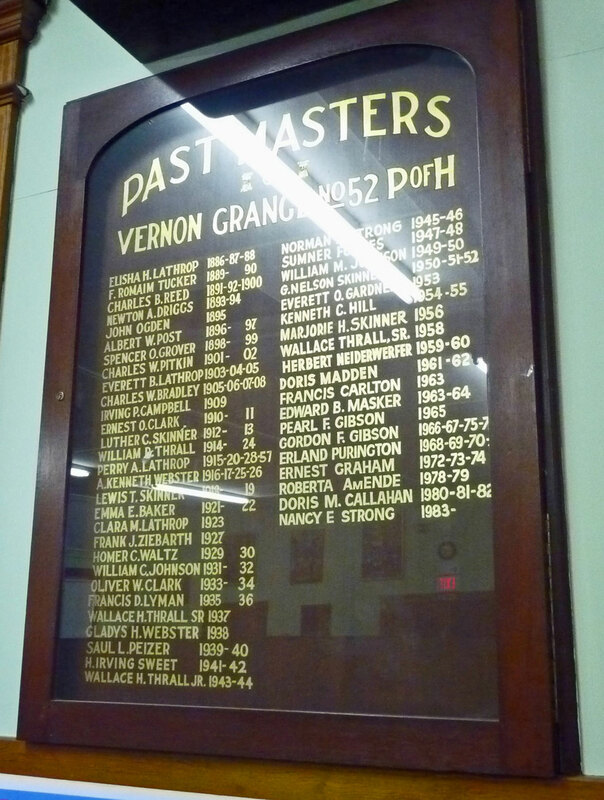 A plaque hanging in the Grange Hall lists 33 young men from Vernon Grange who answered their country's call. One was killed in action. The boys returned after the war and the Grange resumed many of its former activities. The dances were once again held. The Grange had a baseball team and played Grange teams in surrounding towns. The young people presented plays and musicals. There were about 250 Grange members at this time. Talk again resumed about adding on to the hall, increasing the size of the parking lot and having their own baseball field. On July 15, 1948 they purchased the adjoining property to the south from Norman Bell. for the firehouse in 1959. While the Grange continued to thrive for the next two decades, its youth population began to mature. 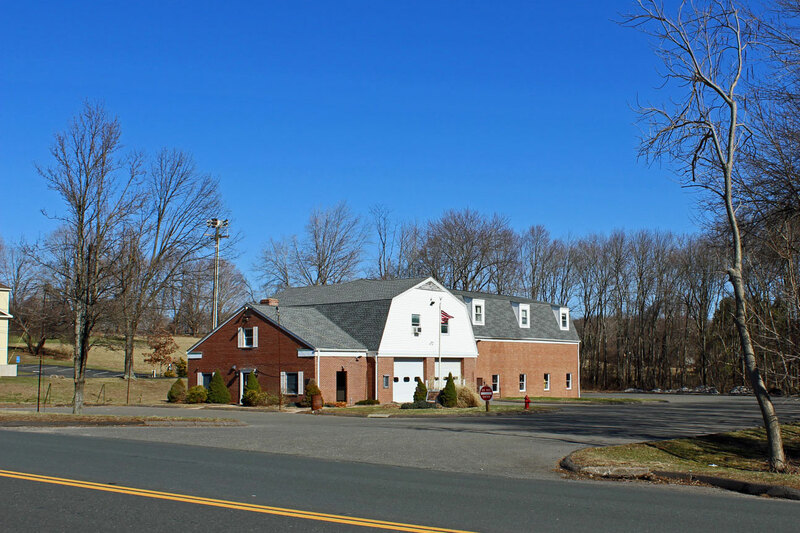 The baseball field never materialized and in 1959 the Grange voted to sell the additional lot to the Vernon Fire District for a new firehouse. With the completion of the interstate through town, Vernon experienced a building boom. The former farm land became house lots with single family homes. Soon there was a baby boom and Vernon could not build schools fast enough. During the 1965-1966 school year the Grange rented the hall to the Town for a classroom while one of the new schools was being completed. For several years they allowed the First Congregational Church at the Center to use the hall for overflow church school classes. With the advent of television the dances became less popular and in 1962 they were discontinued. The grange continued to hold public suppers, provide meals and a meeting place for Agricultural and other organizations and private parties. They also held auctions and food sales. The expenses of maintaining the Grange Hall rose each year. Town taxes on the hall were increasing as were the costs of heating and insurance. It became harder for an older and declining number of members to continue fund raising activities to maintain the hall. In 1980 it was voted to rent the hall to the YMCA for $300 a month. (This amount was later increased to $325.) The Grange was to continue to hold meetings there also. This agreement continued through June of 1983. This was not a very satisfactory arrangement as the old hall could not stand the hard usage which the "Y" required. In the winter of 1985 and 1986 the Grange closed the hall, drawing off the water and turning off the heat. Members continued their meetings at the home of Brother Ernie Graham. This created problems with the plumbing and the varnish on the furniture was affected by the dampness. Town taxes on the property were now nearly $2,000 a year. Surplus funds were disappearing and members were becoming concerned about how much longer they could continue to keep their hall. At the time the Vernon Historical Society was looking for a permanent home and felt the Grange Hall would meet their needs with space for a museum, workroom and storage on the lower floor; and a meeting room and space for special exhibits on the upper floor. They would maintain the upper hall as a Grange Hall because they considered it a part of the history of the Town of Vernon. The Grange would dispense with its kitchen and dining room equipment. It was decided that the Vernon Historical society would rent for a year or two to make sure that the two organizations were compatible. The Vernon Historical Society moved in in the fall of 1986 and before a year was over it was clear that the two societies could become permanent house mates . 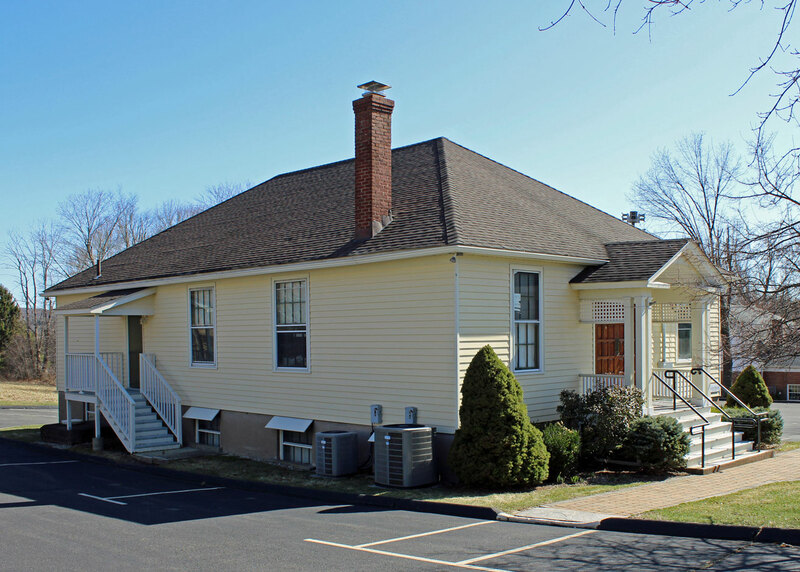 With the help of a grange member, Attorney Robert V. Kahan, and with the blessings of the Connecticut State Grange, Vernon Grange voted to sell the Grange Hall to the Vernon Historical Society for the sum of $1, retaining the privilege of using the hall for their meetings as long as the Vernon Grange was in existence. The papers were signed on August 18, 1989. The Historical Society has made many much needed repairs and improvements to the Grange Hall and grounds. The Grange has disposed of its surplus equipment to allow for the Historical Society's accessions. In 2010, the Vernon Historical Society added an addition to the building that included an elevator and an upstairs lavatory making the building ADA accessible. Vernon Grange is proud to see the building for which they worked so hard be so well maintained and assuming a different important role in the history of Vernon Center as the home of the Vernon Historical Society. 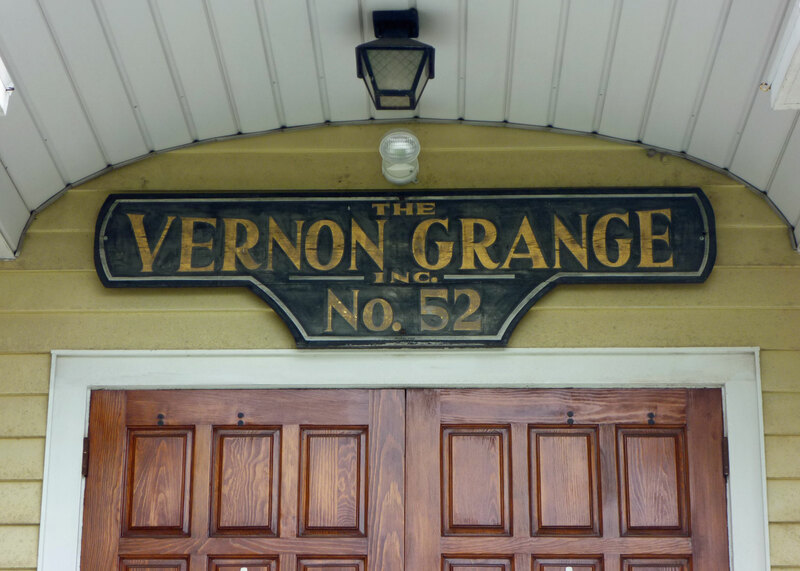 As of today, thirty two members belong to Vernon Grange which continues to meet at the Grange Hall monthly. Many members are descendants of past members and grew up in the Grange family. Several younger members have received college scholarships over the past years from the CT State Grange and continue to receive them. Vernon Grange is active in community service and has been involved with the Grange's active lobby at both the State and Federal levels which in the recent years has promoted the regulation of invasive plant species and farmland preservation. 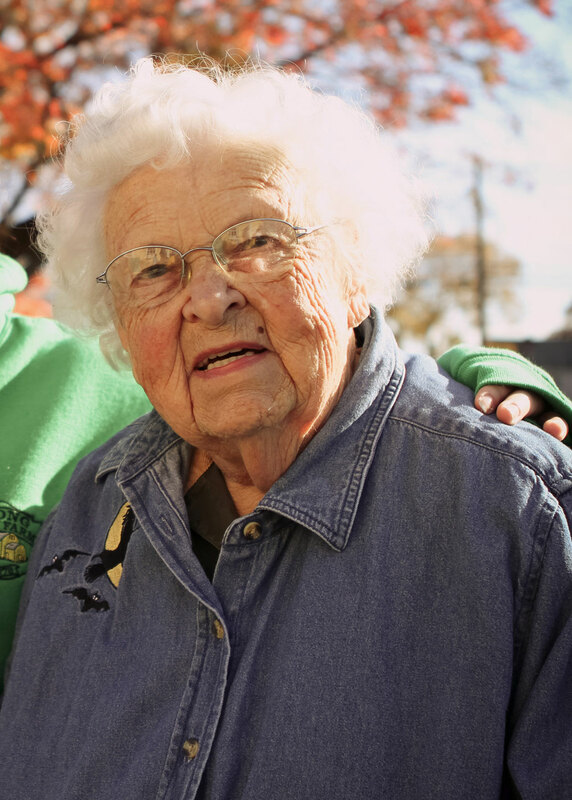 GERALDINE RISLEY STRONG grew up on the Risley Farm on Tunnel Road next to the Tankerhoosen River. She married Norman Randall Strong, whose family has farmed around Vernon Center since 1859. She continues to live in the historic farmhouse where she raised her family. She was involved in all aspects of farm life, including the Vernon Grange. She was also the historian of the Vernon Congregational Church. In July 2014 she was featured in a Journal Inquirer interview. The farm, now known as the Strong Family Farm, is being developed into a nonprofit educational center. This article was previously published in two parts by the Vernon Historical Society in its newsletter, 'NEWS from the Vernon historical Society' in its December 2009 and March 2010 issues. Their full newsletters are available online.